Try Dry Fly – Whisky Critic - Whisky Reviews & Articles - Style. Attitude. Whisky. When you first saunter upon the Dry Fly Distillery collection of whiskies, there is nothing about the packaging that either oozes old school dignity nor screams brazen young whippersnapper superficial taunts. It looks rather nondescript with a rather stodgy [if you ask me] fly-fishing fly as a logo. But this mostly belies what is held within the confines of their glass coffins. Some of it is mediocre, some of it is good and some of it is very good. In the opening scenes of everybody’s favorite movie “Star Wars”, we are met with the iconic phrase, “In a galaxy far, far away….” In an industry where most of the “name” whisky and bourbon is made in Scotland or Kentucky, the location of Dry Fly – in the somewhat remote outpost of Spokane, Washington – might as well be Tatooine or Hoth in some whisky galaxy far, far away. But that doesn’t mean it isn’t worthy of your taste buds. Dry Fly currently has four whiskies in its lineup – the Triticale rye/wheat hybrid, the Port Finish Wheat, the Washington Wheat bourbon and the Cask Strength Wheat – in other words, a good collection sure to please most aliens in the Cantina Bar. The Triticale is essentially a rye mimic and my body chemicals have never been too fond of the rye in the first place so I held this in low regard from the outset. It was about as expected. The Triticale’s foundation grains were born in Scotland in the late 1800’s, so the lineage is good but it is probably an acquired taste and if you have acquired a taste for the rye then you will probably find the hook-up of the wheat and rye grains to be pleasant enough for your liking. The taste does not seem obnoxious enough to completely dissuade the rye aficionado from at least trying it again…and again…and perhaps again. The Port Finish Wheat, on the other hand, has a distinct fruity taste with a smooth texture that goes down the gullet like a seductive Salma Hayek [if Salma is one of your ideas of seduction, if not, fill in with your idea of seductress]. The reason is obvious – its former home was in the barrels used to house the Huckleberry Port of the Townshend Winery on Washington’s west coast. The Washington Wheat bourbon comes in much stronger – at 101 proof – and you can feel that heavy-handedness right away. It’s not the same fire-and-brimstone as you will get in other bourbons of similar proof, but there’s not much subtlety to this one and if that’s your bag, then you will probably appreciate the one-two punch you will be receiving from your first two sips of the Washington Wheat. After that, it settles down a bit and everybody is invited to the party one way or another. The Cask Strength carries the most heat. At 120 proof, you might be expecting even more feistiness than the Washington Wheat, but the Cask Strength actually comes in to your mouth much smoother than the Washington Wheat and stays that way throughout the controlled laboratory experiment you may call your tasting process. The Cask Strength is, for our money, the best of the lot. 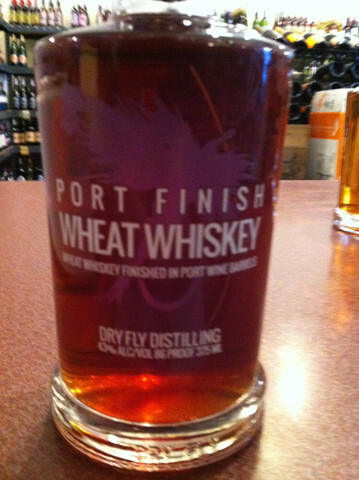 Dry Fly’s specialties are obviously wheat-based whiskies – no surprise coming from the region of some of the best wheat in the land – and they were the first distillery to produce a 100% wheat whiskey in the good old US of A, so you know what you are getting yourself into when you are trying any Dry Fly brand. But, depending on your personal taste buds, of course, we suggest going with the Port Finish and Cask Strength as your best options from this group.